The 2019 Adobe Summit took place March 26–28 in Las Vegas, gathering everyone from advertisers, content managers, and analysts to marketers of all stripes: digital, social, e-commerce — you name it. Marketing Today was there for all three days of the conference, taking the opportunity to speak with attendees who discussed the companies they’ve created, led, or worked for, their takeaways and perspective on what they saw and heard at the conference, as well as more universal aspects of their life and career — sharing some of the best advice they’ve received and things they love and hate — or just really dislike. David Cancel is the epitome of entrepreneurship. He has created companies like HubSpot, Performable, Ghostery, and Compete to bring hypergrowth products to market. Not only that, he is the Entrepreneur in Residence at Harvard Business School and has been featured in The New York Times, Fortune, Wired, and Fast Company. He is presently the founder and CEO of Drift, the world’s first conversational marketing and sales platform. 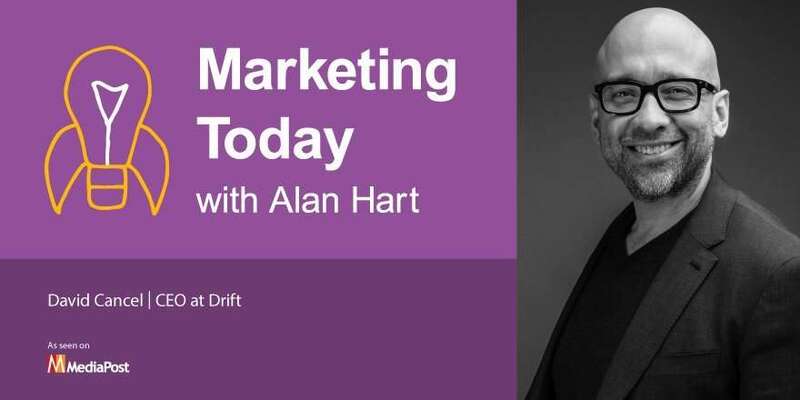 During his discussion with Alan, Cancel provides details on the Drift story — what it is, what it does, and what it provides — and he adds perspective on Drift’s latest integration with Marketo, which was announced during the conference. To that end, he describes the use of Conversational ABM (account-based marketing), what the new level of partnership with Marketo will look and feel like, and how users will experience it. During the podcast, Cancel also touches on how Drift, like Cancel himself, embraces the unconventional. He also discusses his meta way of thinking, why he believes the best advice resides within ourselves, and his passion for seeking out people who are — you guessed it — passionate.